One man must uncover the truth—even when others will stop at nothing to keep it buried. In 2007, bestselling author Steven James introduced us to FBI agent Patrick Bowers in his award-winning thriller, The Pawn. Since then, Steven has written six installments of the Bowers Files. With every one of these, Steven makes it known that he has more and more up his sleeve every time he sits down to write a novel. The thrills never stop and the characters are always vivid. Now, Steven has begun a new series, The Jevin Banks Experience, with Placebo. On the first page, it is clear that the readers is in for a ride that they will not soon forget. We are introduced to the main character, Jevin Banks right away in a highly emotional scene. Jevin is a former illusionist who attempts to debunk replicate the tricks and effects of psychics, televangelists, con men, and fortune-tellers on his television show. In Placebo, we find Jevin and his cohorts attempting to debunk a mind-to-mind communication program, but to put it quite simply, things aren’t as they seem. Soon, Jevin is thrown into a conspiracy that reaches to high places that he could have never guessed. With his trademark suspense, Steven James draws the reader into the story and lets them connect with the characters that populate the novel. 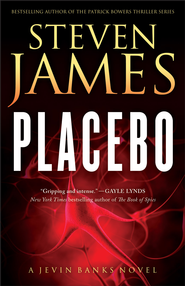 Placebo is a taut thriller that never lets up on the urgency. When you are reading it, you will find that you will be flipping the pages faster than you thought you had been. When it comes to science in a novel, sometimes an author will leave their readers in the dust, letting them try to understand the terminology and how everything works. Fortunately, readers will not have to worry about that in this book as Steven takes time to explain such things without making it confusing or boring. Jevin is easy to connect to. Steven wastes no time in making him easily relatable and likeable. Readers will definitely find him as enjoyable as Patrick Bowers and be looking forward to seeing him again in the second book, Singularity, which will be out about a year from now.